While trying to create a post about terrain and scenery pictures I stumbled across Matt Bace's Flickr stream. He has a lot of "4 Wide" vehicles. This scale seems to be a match for 7P as all the "people" in these pictures are seven plates tall. 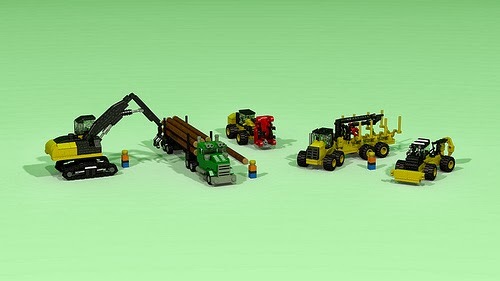 Mini Logging Crew by Matt Bace. I really like that "Caber Toss" vehicle. Yes, I know that's not the real name for it. Heavy Haulers by Matt Bace. Yes, I'll admit it, I have a thing for big trucks. 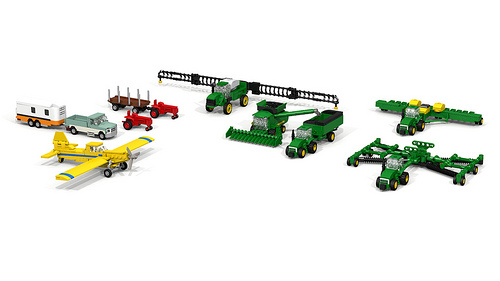 Mini Farm Machines by Matt Bace. 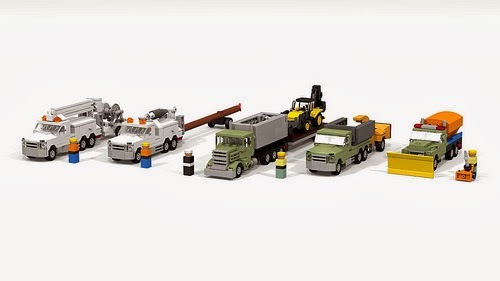 Utility & DPW Crews by Matt Bace. I know it's kinda silly but, the 7P people in this are what makes it for me. 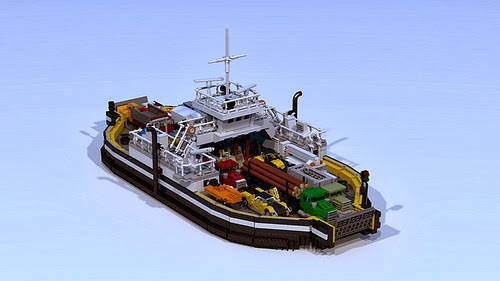 Mini Inland Ferry by Matt Bace. This is his biggest render. It would make for a great centerpiece for a gaming table. He also has a number of Cuusoo projects. Instant MFZ terrain in a set, anyone? A transformable frame has two modes. A transformable frame can only transform during its turn. It has to have a Transformer System. When that system is destroyed the frame is locked into its current mode. A transformable frame has a different system loadout in each of its modes, while still having a maximum of four systems. A transformable frame cannot have more than two systems and the Transformer system in each mode. Okay, how this works is this, we'll make a Soldier archetype into a transformer. It has 2Rd/1B/1G/1Y/1T/2W. The T is the Transformer system. In Mode 1 it has 2Rd/1B/1T/2W, and Mode 2 is 1G/1Y/1T/1d8G/2W. See how that works? You could also go 2Rd/1Y/1T/2W and 1B/1G/1T/1d8G/2W, or any number of other combinations. This gives us a reason to have two forms -- beyond the coolness factor of transforming -- and simulates the different capabilities of each mode. It also forces people to make choices about which mode they want to be in for the turn which is one of the main purpose of the rules of MFZ. Technically a transforming frame can have five systems but, since it has no more than three in any one mode, I think we can handwave that away. Ian Porter from the MFZ Facebook page sent me some sets to review. Thanks, Ian! They're called Mini Blocks from a company called Creatology. They seem to be a blend of Lego and Kre-O parts -- with maybe a few other unknown bits tossed in. They cost $2.99 per pack. This is the first bag. As you can see this is a "Space Fighter" and has 44 pieces. Those sloped blocks in the center of the next to last row are pretty neat. As are the 1x1 Round Plates with Bar at the lower left. Also, if you look at the center front plate, it has a serial number on it. There seems to be one marked piece like that in every set. $0.07 Price per Piece. The legs and head are the most interesting parts of this minifig. I'm going to have to experiment with that head and see what kind of connections I can make. This is a "Tractor Digger" and has 40 pieces. Nothing really interesting beyond the 1x1 Round Plates with Bar and the Tile Clips. $0.07 Price per Piece. This is a "Race Car" and has 37 pieces. Once again we've got the the 1x1 Round Plates with Bar and the Tile Clips. The steering wheel being two pieces is pretty interesting, have to see what I can do with that. $0.08 Price per Piece. Score: 0 (B). That's fair. There are a handful of interesting parts but nothing you have to have right away. These would be good for building up a library of pieces. I have another three packages to review at a later date. Trends come around fairly often in the MFZ community. Here's where I jump on a couple of bandwagons. Several people have built versions of MittenNinja's Locust. I'm hopping on that band wagon with my RB-5 Sentry. I also made a copy of Riptor25's Ijad Wingclaw. I joined the Olive Green bandwagon with this little beauty. Some of the early reviews I did were rated by intuition. In this post I'll re-visit and re-rate them based on the system I came up with. Score: -5 (B-). While this score is pretty low, it's easy to find Daleks in the blind packs and I really like the parts that they're made from. Score: -15 (C). Get this one on sale or as a stocking stuffer. Score: +5 (B+). If you can find this at a better price the rating jumps to an "A". Land Defense Battle Pack review. Combat Chopper review. Technically I reviewed this one already but I didn't give my reasoning behind the score, so here it is. Score: +5 (B+). I guess I was wrong about the original score. There has been some call lately for more discussion of strategy or tactics within the MFZ community. Why don't we define those terms before we go any further. Strategy: This is what happens before you reach the table. You decide on how many frames you're going to bring and what kind of loadout each will have. Also, if you're playing in a campaign, this is when the players determine what the next battle is going to involve. Tactics: This is what happens when you get to the table. The choices you make during the setting up phase, during play, the results of the dice, and the bargains you make during the game are all tactics. Okay, now we have working definitions. Strategy you can talk about. The meta-game(1) is an important part of playing. The choices you and the other players make and how they interact will help shape the game. Tactics, on the other hand, you can't really talk about. How are we going to know the exact positions of everything on the table and how the dice are going to come up before they even happen? So, what we're really looking to discuss is strategy. 1: Thank you, Richard Garfield for bringing this term into the general usage. No, not really. One of the things that we don't really talk about in the community is why the only thing we ever discuss is the question, "What have you built lately?" The driving impetus with the majority of the people that interact on the Hangar, the FB page, or the G+ group is showing off the frames we've created for the game. We only talk about the rules when someone new to the game asks a question, and there's not really much talk about the setting even though that's new to everyone. Is this because it's easier to share a photo online than it is to type a handful of sentences? Is this a holdover from the general Lego community that seems to prize creation above all else? Or does it relate to our need for attention and praise? I realize I'm just as guilty of this as the next person. It's very easy to throw together a quick blog post with a handful of pictures and some, "Ooh, lookit that" text and be done with it. Also, like a fair amount of other builders, I tend to build a lot of one-off designs. Now this is a great way to express creativity but it doesn't really make for a deep and abiding interest in the game itself. I also realize it's the easiest way for people new to the game to express themselves in a meaningful manner. "Look what I built!" is usually the second post on one of the message boards/social media sites after, "My name is..." I don't begrudge people this. It is a time-honored way of introducing yourself. How do we change this? Is it up to the bloggers to point the community in another direction? Do we take the hard tack and start writing things that are more than puff pieces? (And be "we" I mean "I".) Or is this just the way it is with the MFZ community and it's really not going to change? Note: I've been thinking about this for several weeks now. The discussion over what MittenNinja's return to blogdom should look like provided the final push for me to finish this piece. One of the last small sets in the Ninjago line before it is put out to pasture, 70500 can be found for roughly $9.99 depending on the store. The instruction booklet and stickers. Parts 1. These form the framework of the mech. Parts 2. Now we start getting into the fiddly bits. Look at all that gold! Parts 3. Now we're talkin'. Robot arms, brackets, Plate 1x2 w/Angled Bar (enclosed ends), a lampholder, and inverted tiles are all cool pieces. Here are the minifigs. I really want to use that hat on the right for something. This yields a score of +15 (A). This one's definitely worth looking into, especially if you like building in red, black, or gold. I really liked the leg I built back in this post. I attached it to a torso section I copied from Pasukaru 76. This is the front and back so far. Here's what it looks like from the side. As you can see from the picture on the right, the front of the hips connect to the torso by one stud. Also, the way the torso is set up, there's a half stud offset that is preventing me from attaching the back of the hips. I really like the way this looks so far, so I'm going to stick with it and try and find a technique that will help me finish it. Run, do not walk, run to your local Target. They have Umbaran MHC polybags in the Hallowe'en section. They are $3.99 for 49 pieces, which is $0.08 per piece. You also get something that looks a lot like an Ijad Scrambler in one bag. When it comes to sets, I tend to like polybags. They're generally cheap, easy to get, and more than likely have some quickly useful parts. 30057 Anakin's Podracer does not stray from that script. Here's the package. It can still be found in a few stores. I got this at Toys'R'Us for $3.98. Two Travis bricks, one modified brick, six Technic Connectors, four 1x1 Round Bricks, two Tri-Axle Connectors, and a bunch of other small parts. Very nice. Score: -5 (B-). If you grab this one during a BOGO50% sale it drops to $0.08 per part, and the score jumps to +10 (A-). 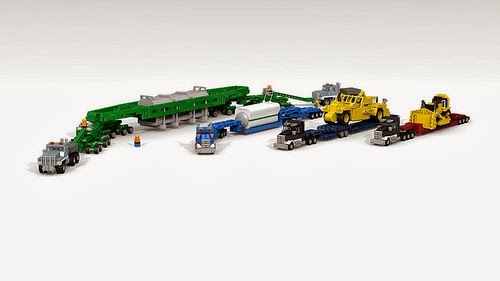 The main problem with Kre-O, at least from my viewpoint, is that the sets are expensive. Transformers, G.I. Joe, Star Trek, and Battleship are all licensed sets and therefore have a premium attached to them beyond the cost of the pieces. Now there's a new line, called Cityville, and it's affordable. This is a review of one of the smaller sets. It cost $8.99 at Toys'R'Us for 104 pieces. The instructions and sticker sheet. Here are the larger parts in the set. The two half-spheres at the top of the picture are a left and right pair, unlike the Lego version. The 2x2 Plate w/Bar (Open Ends) looks interesting. I'm unsure of what I'm going to do with those wheel pieces. These are the smaller pieces. I've already stated my preference for the "mecha claw" pieces at the top left edge of the picture. Further down on the left side, those double-mini claws have already been put into use. The Modified Plate to the right of those claws could make for the grille on a microscale car. Looks like Hasbro wasted no time copying the new Lego mini-brackets. The 2x2 Round Plates w Hole are intriguing. We also have a bunch of parts I've mentioned before. Now here's the really interesting part. These figures look to be a cross between Lego microfigs and minifigs. Weird, hunh? This yields a score of +20 or A+. Winner, winner, chicken dinner! In case some people haven't seen these, here are a couple of interesting developments in the MFZ community of late. A National MFZ Event. MittenNinja is testing the waters and seeing what people think of a national MFZ event. Dude, this should have been a blog post. Get back on the horse already! The only drawback is this would be in the United States, leaving out international fans of MFZ. Cheap MFZ Starter Sets. Over on the MFZ Facebook page, Sage Olsen is talking about putting together cheap starter sets for the main factions found in the MFZ rules. This has been discussed before, so I wish them luck. Chime in on either one of these discussions and let people know how you feel.